I had several comments along the lines of, “don’t name your food”, “don’t name it if you are going to eat it” when I first starting posting pictures of the pigs on Facebook and introduced the pigs by name. Just recently we posted about butchering and eating one of our pigs. Then I posted pictures of piglets on Facebook. The following comments were along the lines of, “How can you EAT them?” “I could never look at that cute little pig, and then eat it later”. I want to set the record straight about us and our farm and the way WE do things. It’s not how everyone does it. It may not be how you do it. That’s ok. We respect your decision, we ask you to respect ours. We believe that we (mankind) are caretakers of the planet, and of the animals and plants that have been provided for our nourishment. We have a relationship with our animals (lots of love, hugs, treats), and yes, we name them. We aren’t bloodthirsty savages. We aren’t out slaughtering any meat animal for fun. We take what we are doing very solemnly. We treat them well because the end product is what we will be able to feed our family. We want their time on earth, no matter how long, to be one where they are not just a number. They have value to us. Maybe it doesn’t matter to the pig if I spend an hour a day in the pasture with them, talking to them, loving on them. What if it does? You have seen the pictures. 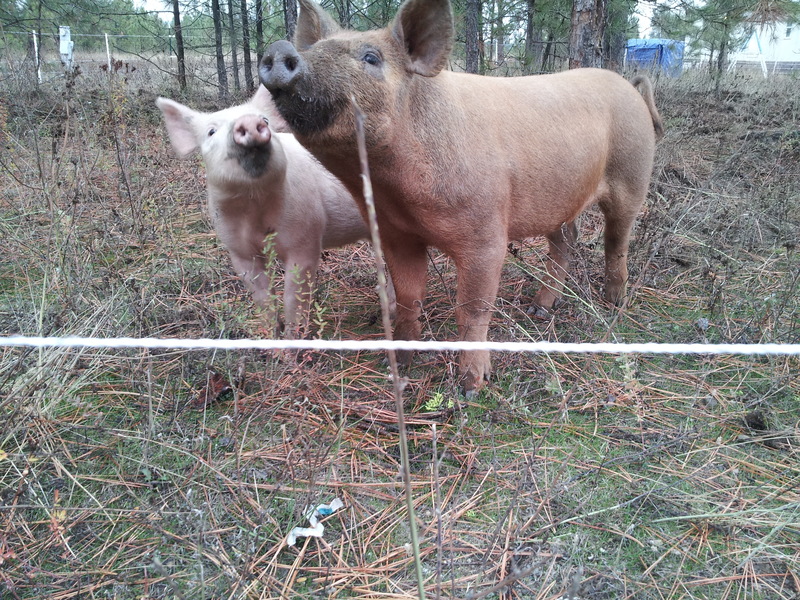 Do these pigs look malnourished? Mistreated? Scared? I think they look happy. It’s painful to me to see pictures of factory farm animals that are in small cages. I cry when I see these pictures, but instead of just never eating meat again, we raise our own, with their health, and ours, in mind. While I am on the subject, if you are a non meat-eater, please don’t jump on us or assume that our animals are subjected to the same kind of treatment you see in pictures or videos on Facebook or other social media. The only cages you will find on our farm are a couple of dog kennels we use to transport chickens and piglets. 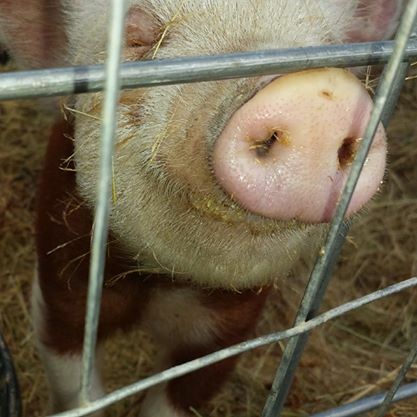 Yes, I DO get attached to my pigs. I’m thankful that we get to be the caretakers of them. It makes me a whole lot more mindful of where my food has come from. It means that our freezer is full of meat provided from an animal that was treated with compassion and respect from the moment it steps foot on our farm until it’s last breath. As a whole, I think we (society) have gotten away from knowing where our food has come from. I know my grandma knows what it was like to sit down to supper knowing that it was Henny Penny on the plate, that her mom had butchered that morning. You didn’t fuss and cry that the old hen was gone, you were thankful she’d provided the eggs you ate for breakfast for the last few years, and now she was providing yet another meal. Past generations didn’t run the grocery store to pick up their meat and eggs like we are accustomed to doing now. I will say, these aren’t house pets. They are farm animals. Raised for the purpose of filling the freezers of families that appreciate pasture raised pork and poultry. And until they leave the farm, they will be treated with respect, love, and lots of attention. The smile on Chuck Norris’ face, says it all…he looks pretty content to me. 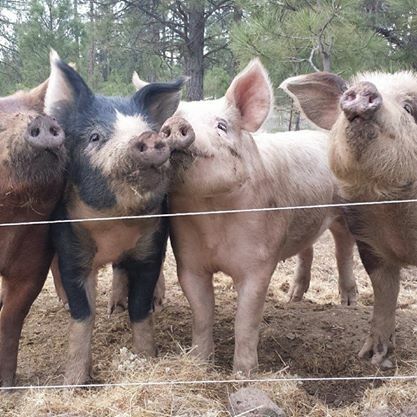 This entry was posted in Livestock, Poultry and Creatures Tame and Wild and tagged freezer meat, healthy pigs, homesteading, humane, humane treatment, naming pigs, pasture poultry, pastured chicken, pastured pork, thankful by Charity. Bookmark the permalink. Spot on. We haven’t gotten to butchering any of our animals yet. But we feel the same as you. Right now we just have the chickens and I look at them as members of the farm. We respect their existence by providing for their needs, keeping them safe and entertained. When the time comes they will be dispatched, culled, killed however you want to put it and we will give thanks that they spent time with us and provided sustenance for our family. There is nothing like knowing what went into your food and what they were before. It is the internet….don’t let what folks say get to you…. “How can you EAT them?” “I could never look at that cute little pig, and then eat it later”. Not for nothing but where do these folks think the meat in the freezer at a grocery store cam from? Some of these folks are living proof you just can’t fix stupid…..
God gave us the animals for food. When I was growing up we ate chickens, beef, and rabbits that we raised. We took good care of them before that.